The journey home could not have been any slower and more stressful , I just wished I could snap my fingers and be in NYC instantly. But more or less Efosa is back in the Big Apple (thank you God). Throughout my journey in Europe, my friends created a new name for me, “Traveling Queen” or “Dora the Explorer” because this whole year I have been around the world non-stop lol. It felt weird being home because I expected it to be colder than it was and I thought I would be greeted by snow, but I was mistaken. Parents were excited to see me once I arrived, surprisingly jet-leg did not hit me as much as I thought it would (I guess my late nights in Alicante paid off lol). As I reflect on my study abroad experience in Europe, one of the hardest things I had to do was say my various goodbyes/see you laters to the many people I met on this journey because the memories we all share will always be in my heart. My Denver Crew: Marysol, Yvonne, Jaime, Byron and Jack thank you all for the fun Alicante nights, accompanying me to Morocco and helping me celebrate my birthday away from home to make it special. Marysol, Yvonne, and Jaime: Calpe was a thrilling and eventful trip climbing the mountains, watching out for the seagulls, and making sure no one made the wrong step or turn. Marysol and Yvonne: the two best of buds you guys helped me keep sane during my frustrating times when some of the Spanish professors’ explanations did not make any sense at all. I will miss our times in the cafe shop which served as our study session and study break spot, we have a lot of memories there. Overall, I wish you five the best of luck in your future endeavors and until next time. My Norwegians: Annette, Ingrid, and Anniken you guys are SO AWESOME. Annette, I am going to miss you in the classroom and your facial expressions that illustrated exactly how I was felt when the teachers lost us during their explanations. Good luck with your horses and everything else in the future. Ingrid, the one always with a smile and knows how to have a great time and live life carefree. I will miss your no pasa nada spirit because you always found ways to see the bright side of situations and knew when it was time to let a situation go and move forward. Good luck with your remaining months in Spain learning Spanish, I wish you the best of luck on the DELE exam. Anniken !!!!!! we met at such a short period of time, but made sure that the time we shared was filled with laughter and great times. Even though I never knew what you and Ingrid were saying when you guys spoke in Norwegian, I will truly miss it because the way you two easily switched from English- Spanish- Norwegian without any hesitation was fascinating. Please be safe in the army and can’t wait to see you when you are done. I can’t wait to see you all when I come to Norway. 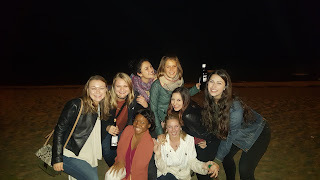 Spanish Study Abroad: The original squad I love you all sooo very much. 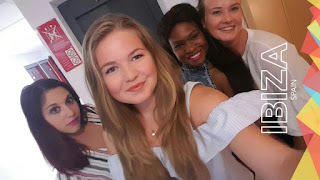 Thank you all for making my trip to Europe a great one and helping me with my Spanish and encouraging me when I felt I was not making any progress. 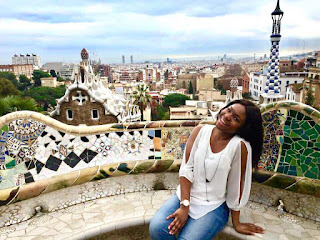 I was fortunate enough to share my study abroad journey with was not easy at all. These past four months we shared SO MANY MEMORIES I WILL FOREVER HOLD IN MY HEART. It is not goodbye but until next time. I love you guys so much and goodluck with your future endeavors throughout college and years after. Lauren Perone: Peroniiiii!!! Peronester ! The girl who was going to go to Ithaca College , but ended up changing her mind last minute and enrolling into Susquehanna University. You are an amazing person with a kind heart. I want to say thank you thank you thank you so much for pushing my buttons when you did because you helped me exercise patience for others when I felt my New Yorker was coming out. 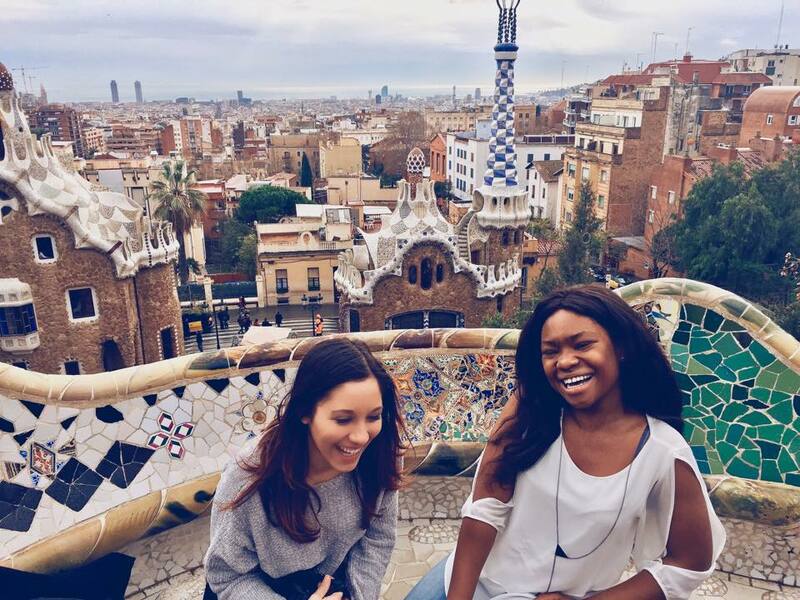 From Ibiza to Morocco, Torrevieja, Granada, Valencia, Madrid, and Barcelona, you became my official travel buddy we share so many memories that will last both of us a lifetime. I am glad I was able to be there for you when you needed me and when you did not want to hear the truth, but I think that is what friends are for. Thank you for being a friend to me away from home. Well that’s it folks, Efosa is signing out thank you to everyone who was with me throughout my study abroad journey. I love you all very much. Until next time. Returned safely from my six day trip and the reality that I will be home in the next forty-eight hours is surprisingly hard to conceive because I have been away for so long. Before, I left I went to the University of Alicante again and just observed my surroundings and soaked in everything I could as it was my last day on campus. I went to the Spanish Studies Abroad office and said my see you laters to Pepa and Marisa who are two phenomenal women who made my journey in Alicante wonderful and helped me become comfortable with conversing in Spanish. I got home and wrapped up my packing (good thing I started in November lol) and had to wear a few layers of clothes to make room in my luggage lol. Before I left, I thought to myself how I want to see my host family’s children and grandchildren so I can say my goodbyes. I guess God heard my request because around 7pm I heard my host mom, Carla, Vera and their mother enter the house and thirty minutes later her husband and my host dad entered the house. I was so happy because I knew they were going to stay for dinner and as my last dinner in Alicante, I was grateful to spend it with them. While dinner was getting made, I was playing with Carla and Vera and it amazed me how in these last four months they grew on to me that it was actually very bittersweet that I would not be seeing them as often. Dinner time arrived and we had a great time talking about our day and then I ended the night by reading a letter to my host parents, then to Dori and her husband and I wrote two letter to Julia and Maria since I was not going to see them before I left. 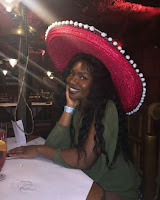 In the letter to my host parents, I expressed how I am forever grateful for what having patience with me as I improve my Spanish speaking skills and get acquainted with the Spaniard lifestyle. In addition, how their family is blessed to have them as role models and how I will miss my host dad’s jokes and my host mom’s Spaniard dishes. I could not get through reading the letter without crying no matter how many times, I tried to pinch myself to stop the water-works from coming, it was to no success. As for Dori and her husband’s letter, I thanked them for showing me the importance and blissful blessings of finding your soulmate and building a wonderful and strong family. Furthermore, how I aspire to have that in my future some day. Lastly, I told them all how I love them all so much and they will forever be in my hearts. I continued to keep crying that even Carla was asking her father why I was crying and he expressed she is just emotionally happy right now. They were all so touched by the letters. The night came to an end and we exchanged hugs and social media handles as a way to keep in contact. Friday morning came and it was time to head to the airport. As I hugged my host parents, I cried a bit again (I will never understand this whole phenomenon of being happy to go home but when the day actually comes you are crying your eyes because a part of you wants to stay a little longer). Thank you God, Mom and Dad, Ithaca College, Europe, Spain, and Spanish Studies Abroad for a life changing experience. My sociology final was three days away and I was half prepared, or so I thought. Therefore, I studied harder by reviewing my notes and the slide shows given by my professor. When test day arrived, my professor was so happy to see me and she reassured me that the exam was not going to be difficult as long as I paid attention in class and reviewed my notes (which I did). When I tell you all finals week was like no finals I have ever experienced throughout my college journey, trust me it was not. Basically, the exam was five questions which were very straightforward to the point that I had too much information for each question. At that moment, I realized I studied too hard for the exam and finished it within twenty to thirty minutes. I spent the remaining time reviewing my answers and then submitted it. Afterwards, I had a last time conversation with my professor who is a phenomenal person. She is from Spain, is a business owner of orthopedics, a wife and mother. I really enjoyed having her as a teacher because she shared with me how studying abroad and living with a host family in the United States continues to have a life changing impact on her life since her college years. Before, we said our goodbyes she emphasized the importance of keeping the connections I made throughout my time in Europe (especially with my host family and professors) because it will go a long way in the future. Now that I was done with finals and had a week left before it was time for me to go back home. I needed plans to make my last week fun and not dreadful. Fortunately, my friend Lauren, who is in the same study abroad program with me pitched an idea for us to use our last week in Europe to travel to Madrid and Barcelona as a way to see more parts of Spain, but more importantly curtailing our eagerness of returning home. So we planned a six day trip between both cities ensuring we do all the touristic sites while relaxing at the same time. As the days became closer to our new trip, I started to second guess the whole thing because a part of me just wanted to be back home. Once we our adventure started, I was very grateful I did not back out of our plan. Let me fill you the Lauren and Efosa adventure time! We took a bullet train from Alicante to Madrid (it is called a bullet train because it only took us two hours to get there). The majority of the train ride was good, but the older Spanish women felt it was okay to talk very loudly throughout the train ride (oh did I forget to tell you, it was a six am train ride) so we were highly annoyed but got through it. When we got out of the train station there were these weird huge black babies heads (one was smiling and the other looked possessed) they were pretty creepy. Anywho, we get to our hostel called, “Way Hostel” if I am not mistaken. Let me tell you that hostel was AWESOME we booked a six person hostel (the location of it was perfect from everywhere) it had a dope sitting room, kitchen, comfortable beds, free breakfast and 3 EURO paella and 1 EURO sangria for dinner. Huge shoutout to Lauren for finding this place for us (she has knack with finding great places to live for reasonable prices). 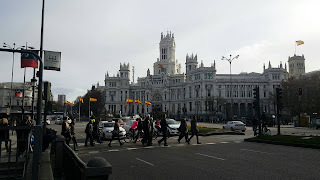 We visited the Cathedral de la Almudena which is a very interesting church (I might add) there were many resting sites which was creepy because they were on the floor and it was free for people to walk over (which I was uncomfortable with at all). Initially, I thought it was people from the eighteenth and nineteenth century who were buried there, but actually there were people from this century who were laid to rest there. One resting site that grew on me was of a young woman who died either 5 or 6 years ago , she was maybe in her forties when she passed away. Even though, she was a complete stranger to me , my heart went out to her and her family because whenever a person’s life is cut short it always puts me in a melancholy state. 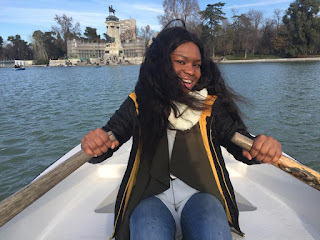 Enough of the sadness, the other place we visited was El Retiro Park which is a huge park great for taking long walks, pictures with live statutes, or the best part go on a forty-five minute boat where you row to the other side of the park. It was a great experience for me because it was my first time rowing a boat and thankfully Lauren was a girl scout and knew how to row. For starters, rowing is not an easy thing at first it is a full body workout especially for the arms (shoutout the the IC crew team who does this day in and day out). Occasionally, the boat experience was interrupted by people being careless with their rowing resulting in Lauren and I having to act fast so our boats did not collide with other people. There was a point in time it became so bad that we decided not to care anymore and brace ourselves when people collided with us and row to the other side of the lake with fewer boats. It was a relaxing and soothing experience for us nevertheless. We met a couple of cool people in our hostel for example a half German and half Brazilian guy who became great friends with us after I found his wallet in our hostel. He had amazing hair like it was a gift from God, his hair. During our stay there, he talked about how he visited New York for a couple of years and was very familiar with the Manhattan area. We all ended up talking about the city life and our individual journeys throughout Europe. Madrid reminded me of home a bit because of the fast pace lifestyle and it was very preoccupied. Our trip to Barcelona was probably the best one saved for last (minus the Park Guell). Before, I start to talk about the places we visited, let me tell you about our hostel experience. We booked another six person room at Mediterranean Youth Hostel, also a great place for anyone who is looking for a place to stay in Barcelona for great prices. After we waited for the check-in time, we were told our room number was 102, but when we tried to use our keys for 102 it did not work so we thought let’s try 103 maybe it was mix up, nope the key did not work for that as well. So then we decided to go to 201 and guess what our keys worked and we settled into the empty beds we saw took a siesta. I would say forty-five minutes to maybe an hour later a couple entered and apparently, Lauren was in the guy’s bed, but the bed was not made so we assumed it was unoccupied (oh did i forget to mention there were no assigned beds it was a free for all). After five minutes a guy from the reception came and was able to solve the issue by convincing the guy to move to another bed. Just when we all thought everything was handled three hours later there was another bed issue so the same guy from reception figured out that we were put in the wrong room, we were supposed to be in room 102 not room 201. Lauren and I said yes we figured that but our keys did not work for 102 only 201. As a result we ended up having to move all of our stuff back to 102. The reception guy was so sweet he offered us free drinks from the hostel as a way to compensate for the inconvenience and informed us to talk to his boss in the morning about the incident. Long story short because this is getting too long, after talking to Lauren about our options of compensation we decided to see if we can have our dinners for free for two nights. The next morning came and I saw the boss and discussed about last night events and was able to convince him to let our dinners for the next two nights be free. Mind you we were only staying for two nights ! ( we were able to save money big time during Barcelona). Lauren and I realized that us together we are good luck because our trip went better than plan. 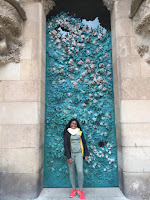 Now, back to the places we visited while in Barcelona (many were disappointments in my eyes and one was WORTHWHILE). 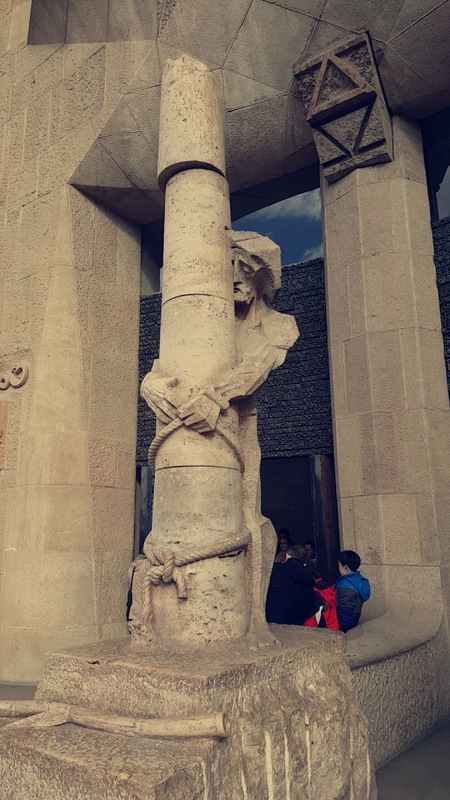 First place on our list was the Sagrada Familia which is a well known church in Barcelona, it was currently under construction so we were only able to see the outside and the one floor of the church where mass or important services were/could be held. The statutes were impressive and the color scheme of the church’s windows, but after five to ten minutes of being in the church, I was shocked to realized it was only the first floor that was open for people to see; I thought there was more to it. Afterwards, we discovered another part of the church where mass was being held (I guess until the construction was over) and as a past practicer of the Catholic religion, I felt it was extremely rude for while mass was going on tourists were allowed to take votes and tour the church while the priest was conducting the service. Personally, I thought that part should have been closed off until mass was over because it was highly inappropriate in my eyes (Lauren felt the same also, we could not stay any longer so we headed back to our hostel). Following day, we visited Park Guell which is famously known for being in the Cheetah Girls 2 movie where they went to Barcelona and there is a song called “Strut” that has Park Guell in the scenery. 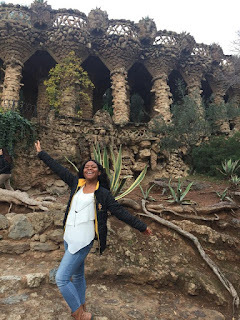 When I tell you the movie hyped up the excitement of Park Guell, I am not lying because when Lauren and I got there were in disbelief of how non-fascinating it was. Park Guell consist of the nice marble design (seen in the Cheetah Girls movie) with a great view, at the bottom a marble lizard, and houses people had to pay extra to see inside. Lauren and I were not amazed at all and were ready to head back home. Prior to embarking on our six day trip, we found out that one of days in Barcelona will be a rainy day so we decided to make it an indoor activity and head to the Aquarium. Initially, I was thrilled for this because we were going to see the different feeding times of penguins, rays, eagle rays and morays. But to our disappointment, there was no organized schedule for these feeding times as listed on their website. 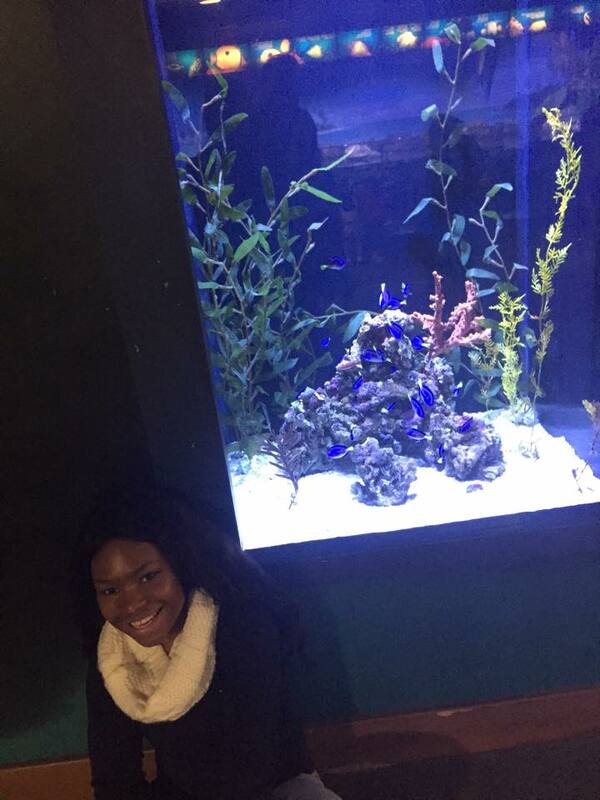 Besides that we were able to find Nemo and Dory which was awesome because we were able to be big kids at heart again and enjoy seeing all the cool different fishes in their habitats. The best part for both of us in this whole trip was THE ARABIC BATHS: AIRE BARCELONA. I thought it would be a great idea for our last day in Spain to end on a high relaxing note and what better way to do that then go to an arabic spa where you can get massages, rotate between various heated pools (room temperature, very hot and very cold), drink Moroccan tea, and listen to soothing relaxing music. When I tell you all that MASSAGE WAS BOMB AND MUCH NEEDED *sighs* (just thinking about it brings a smile to my face). Lauren and I left that place like new people ready to go to sleep and finally stress-relieved to pack and head back to the States. I really enjoyed myself during those six days, it helped me appreciate Alicante’s tranquil lifestyle more. I officially have one month left until I head back to the United States and get fully acquainted with my life. I am excited to spend the holidays with family and friends, eat my mother's delicious food, and be in the comfort of my own bed. 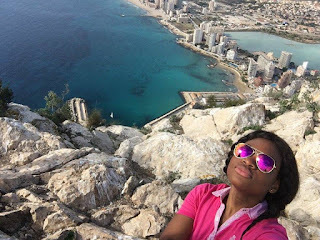 Even though I am eager to go home, I will miss the tranquil lifestyle of Spain especially the beautiful view of the Mediterranean Sea. As the semester is coming to a close “finals week” is slowly approaching and I have to study for my introduction to sociology final. Last day of classes for me were on the 1st and my final wasn't until the 14th, so I basically had a lot of free time on my hands. During my spare time, I watched various African movies on Youtube, discovered new shows on Netflix and most importantly caught up on sleep while boredom started to creep up again. Luckily, I had an upcoming trip to Italy to visit one my cousin’s best friend (who’s work ethic I admire) who was studying abroad in Florence. The trip was very enlightening because it was interesting to see how similar Spanish and Italian were to each other. We caught up on old times and discussed our study abroad experiences in our respective countries. Throughout my stay in Italy, we visited the Duomo also known as the Florence Cathedral, the Uffizi Gallery, the Arno, the Ferragamo museum, and other historic and touristic sites. Out of all the sites my favorite two were the Uffizi Gallery and the Ferragamo museum. The Uffizi Gallery is a three story mansion filled with the history of the Medici family, many artworks from notable artists such as Leonardo da Vinci and Piero della Francesca. Two art pieces I was amazed by were the, “La Toscana Di Piero Della Francesca” which was by Piero Della Francesca and “Annunciation” by Leonardo da Vinci. 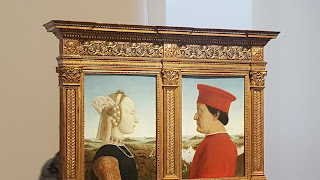 The painting created by Piero Della Francesca is a portrait of Duke and Duchess of Urbino and when looking at it at first sight I thought it was a symbol of their love. However, in actuality this piece of the royal family has a story to it. For example the Duchess of Urbino’s skin was very pale because during the time of the creation of the artwork, she died from acute pneumonia that was caused by childbirth. In addition, the Duke of Urbino was a well known warrior and during a battle he lost his right eye and as it turns out he had a chunk of his nose removed. 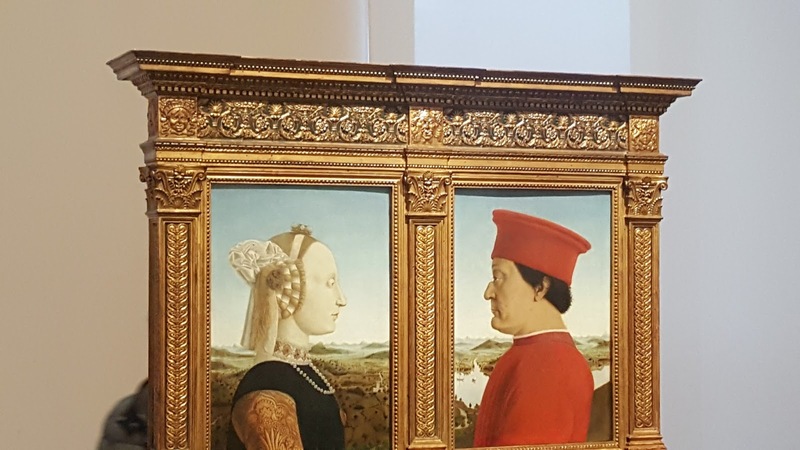 Due to his pridefulness in his image, the Duke made sure Piero Della Francesca painted his left side because he did not want people to think he was weak. Once I heard this, I was shocked because when viewing the painting I would have never expected this, but the Duke sure was a cunning guy. 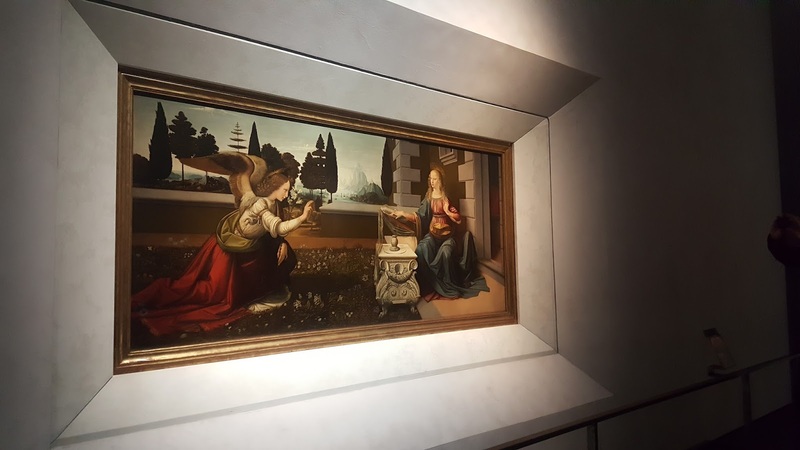 As for the “Annunciation” painting by Leonardo da Vinci there is an angel Gabriel and Virgin Mary and it illustrates the night he informs Virgin Mary that she will conceive and give birth to baby Jesus. 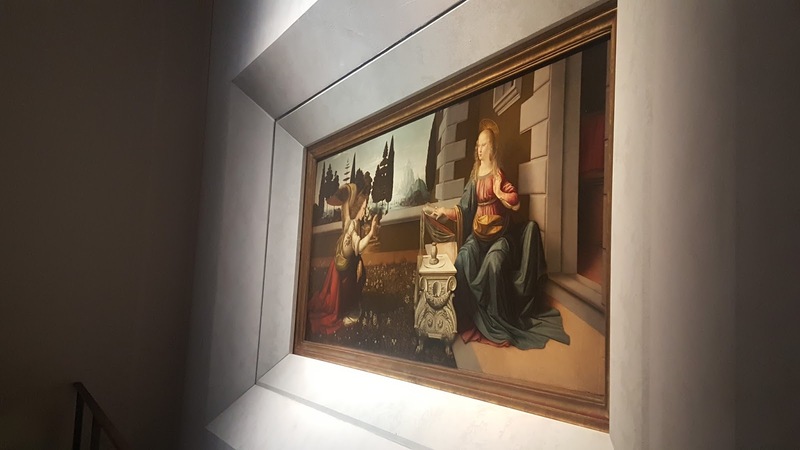 Here’s the catch to the image, when people first sighted it they did not believe it was one of Leonardo da Vinci’s art piece because of the “imbalance” of the people. However little did we know Leonardo da Vinci, knew what he was doing and we were viewing his artwork incorrectly. When observing the image from the left side, Virgin Mary’s arm seems small compared to her body. But when you look from the right side of the image, her arm looked proportion for her body (overall he was an artistic genius). The Ferragamo museum it consisted of fashion shoes, dresses, and models created by Salvatore Ferragamo and his descendants. In the museum there were also styles from other Italian designers. I was really impressed by the various foot models of famous people from Marilyn Monroe, Jennifer Lopez, to Michael Jordan (let me tell you he has some huge feet). Lastly, there was a handmade dress with a design that was hand painted by the designer, whose name I cannot recollect at the moment. 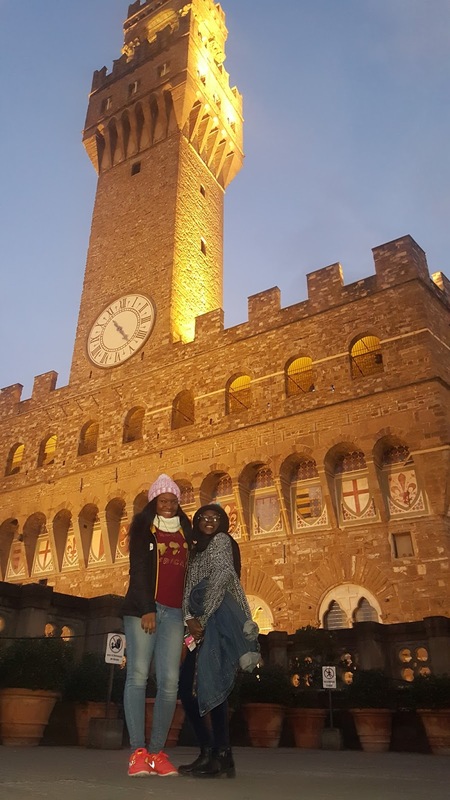 Overall, Florence is a very beautiful city with an array of fashion styles that I felt described the different time periods very distinctively. 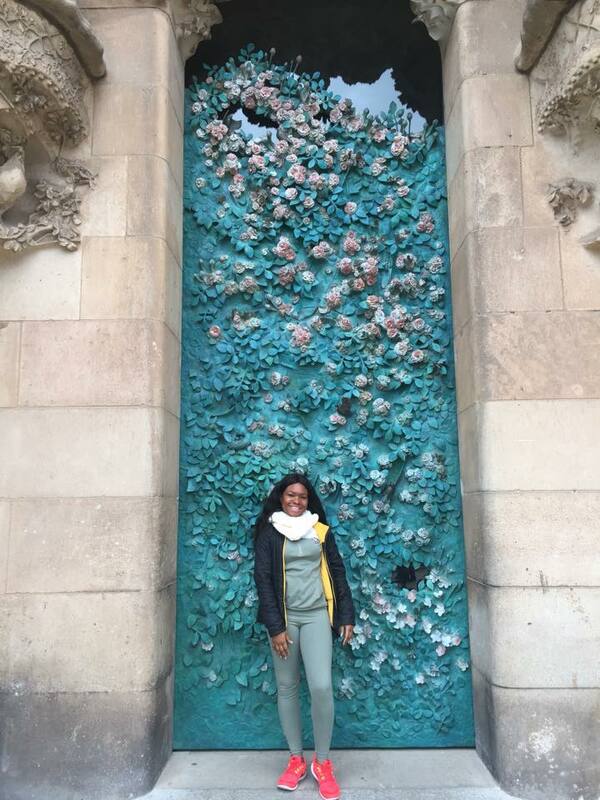 I really enjoyed my time in Italy and it was a great study break. November is known as the month of giving thanks and spending time with your family and friends. I have a lot to be thankful for this year: God for all the blessings he has bestowed on my life,my family and friends for their love and support, different journeys and experiences I have been able to embark on with the help of my scholarship program The Tiger Woods Foundation, my study abroad program Spanish Studies Abroad, and my institution Ithaca College. 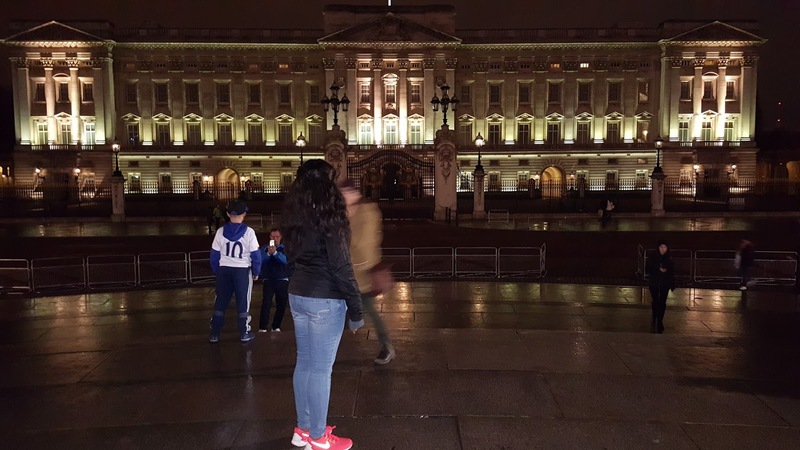 One of those experiences this month was my trip to London for the very first time. I went to visit my aunt and her family who moved there five years ago. 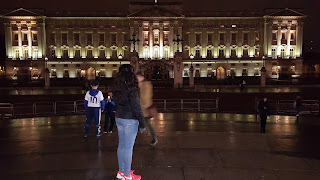 When I arrived to London, I was quickly reminded of what soon awaits me once I arrive in New York City the cold fall weather, fast paced lifestyle and extensive metro system, everyone speaking English and seeing English signs. But London was a reversal of America. For starters the driver seat is on the right side rather than the left side. The fast lane when driving is on the right which is our slow lane in the States. However, London is really expensive compared to America for example when you buy an oyster card (which is the card for bus and train similar to a metro card) it can be used for both bus and train but the fares are different and you are charged based on the distance of your journey. I felt that was outrageous and confusing because in NYC there is just one flat rate and it doesn't matter the distance of your journey. The payment is for both the train and the bus. Thankfully, my fourteen year old cousin accompanied me throughout my time there. When I took the bus for the first time in London, I felt like a little kid because their public buses are similar to our time squares tour buses. As a result, I ran up to the upper deck with my cousin and sat at the front of the bus enjoying the ride lol. My cousin couldn't help but laugh at how excited I was to ride the upper deck. On the first night my cousin and I went to see the Aladdin play. I was surprised to find out that the program aka playbill did not accompany the tickets. Basically, there were two different types of programs: a very small one with the actors and actresses biographies for 4 pounds and a huge program with all the plays stage performance pictures for 8 pounds, but if you buy both it was 10 pounds. I felt it was a huge rip off because I am used to all of that being included in the price of your tickets. The show was amazing my cousin and I really enjoyed ourselves. Afterwards, my cousins and I spent time talking about the differences and similarities between our two countries. It was funny to see the various words we used to mean the same and at times found ourselves not understanding what the other was saying because of those words (e.g candy vs. sweets, curling wand vs. roller etc). 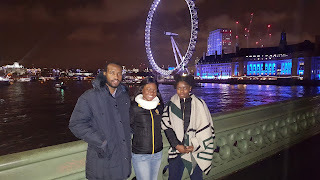 As my trip to London was slowly coming to an end, I went to visit a friend who was studying abroad in London and she took me to an African event where I meant new people and I was able to see how much London loves culture especially African culture. 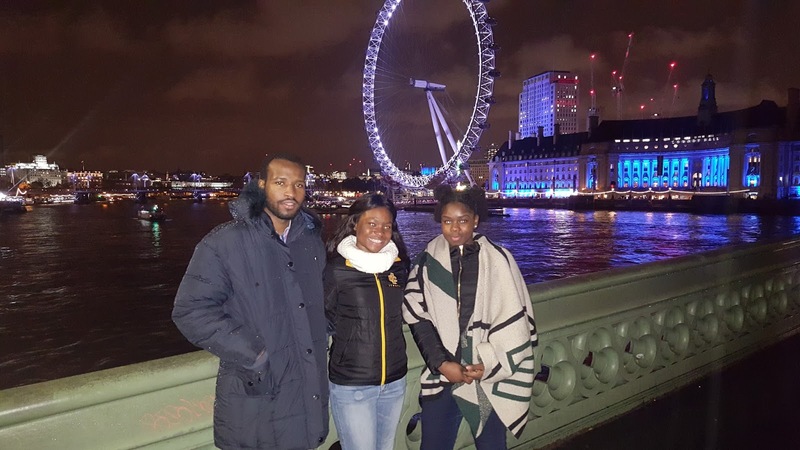 My trip to London was very much needed and I was grateful to spend time with my family and friends. 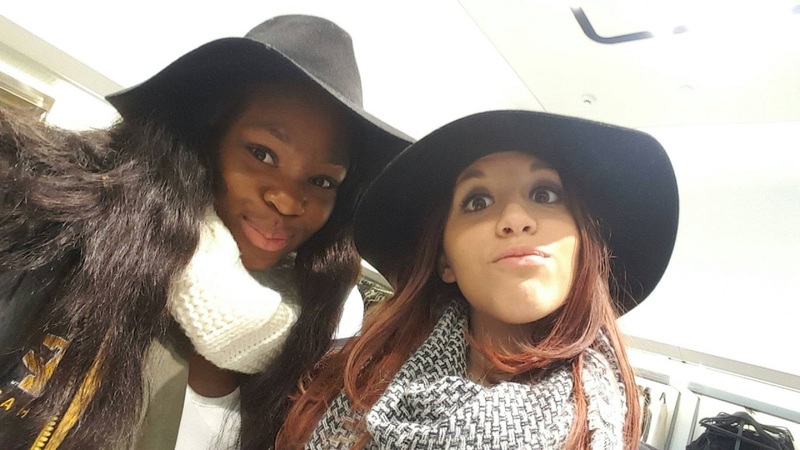 Remember the young girl I wrote about in my last blog who is half German and half Nigerian? I saw her again on the bus on our way to school. 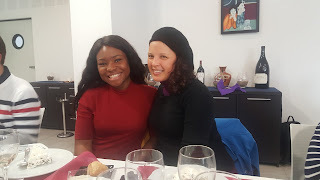 She told me that after our last conversation during the cooking class I inspired her to do more research about the Nigerian culture and most importantly her family's roots. Furthermore, she was able to confirm my statement of a people's identity is more defined by their tribes than by the country itself. 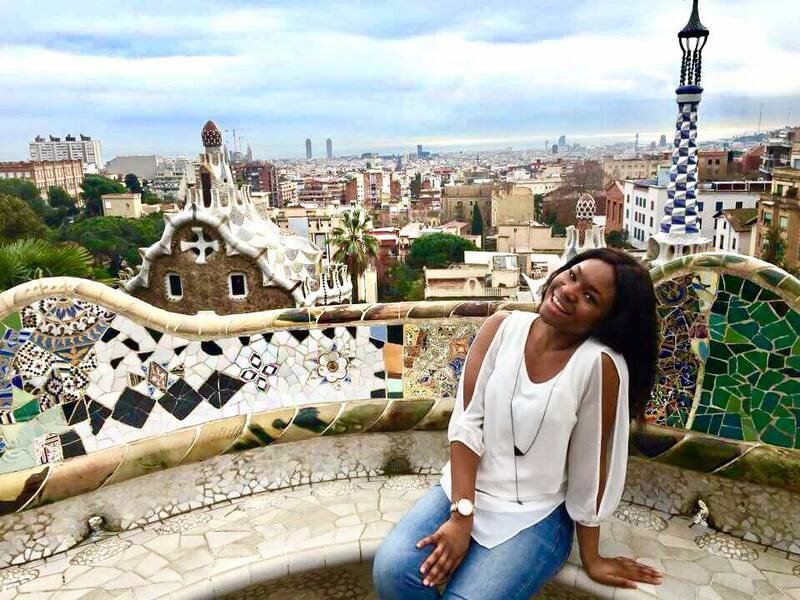 She was so fascinated by the different aspects of our culture that she wants to one day visit Nigeria and experience the culture. 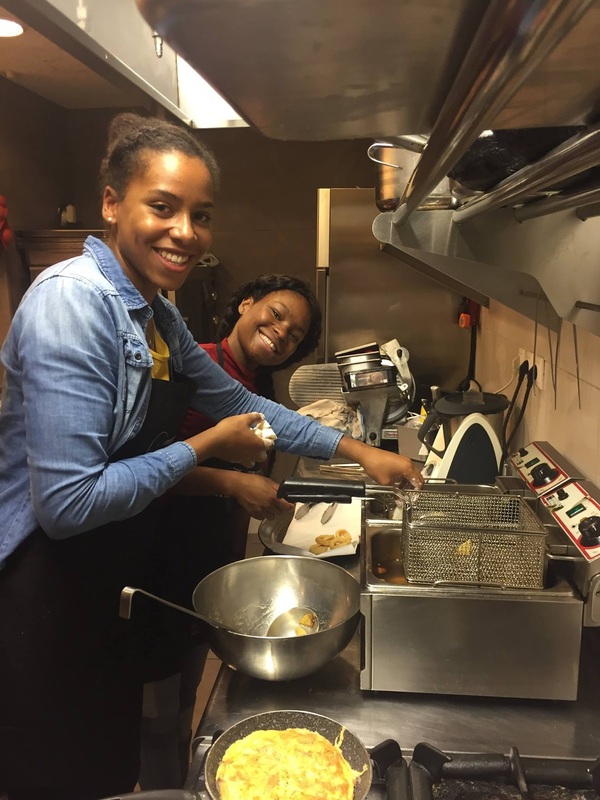 I was amazed by how me reminiscing about my time in Nigeria could influence another person to explore their roots. Thanksgiving Day has finally arrived and it was the first time I have ever spent it without family and friends. At this moment homesickness was at an all time high because I was thinking of all the great, delicious, and fulfilling food and the good times with family and friends. 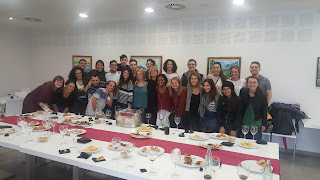 Thankfully, Spanish Studies Abroad arranged a Thanksgiving lunch for us (which was pretty amazing in my opinion) where we laughed, talked about how we were and expressed what we were thankful for. I really enjoyed the dinner, the program did well even though many of was away from home. I am thankful for the way God has protected me through all my trips around Europe while still doing well in classes and learning a new language. This month marks my last month taking Spanish courses and a month before it is time for me to return back to the city. Year 2016 will surely be a year to remember. 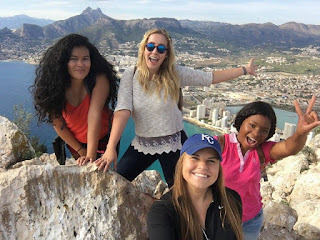 As a lot of you know I am studying abroad in Spain for a semester embarking on life changing experiences and meeting people from all over the world. But what many of you don't know is that the Spanish lifestyle can get boring at times for a city girl such as myself because you end up doing the same activities (beach days, climbing the various mountains, attending classes, nightlife, and taking siestas) constantly every week and there is no element of surprise. I started to think what can I do to keep myself busy and entertained during my last few weeks here in Spain. Here at the University of Alicante there is an office called Centro Superior de Idiomas (Center of Languages) which is the building that deals with the language courses for all students (both international and domestic). In addition, each month they provide activities for international students to participate as a way to let us meet people and learn about the living culture in Alicante and other parts of Spain. There are cooking courses, winery tastings, snorkeling, trips to Barcelona, Granada and Valencia, tickets to soccer games etc. 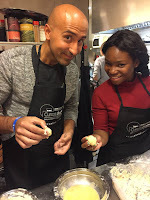 Anywho, I became very bored and was starting to miss the excitement of home, but as luck would have it a classmate (who is a Cardiologist in Canada, but his roots are in Iran) of mine suggested I accompany him to a tapas cooking lesson since it was his last day in Spain. Since I never participated in an activity, I decided to give it a try. 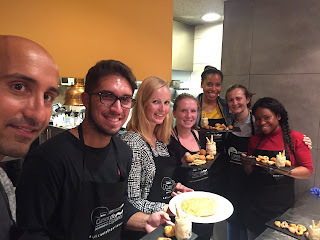 The cooking class took place at a nice small restaurant called Restobar Gema Penalva where we learned how to make croquettes, ensalada rusa, calamares, and tortilla patatas with red wine or sangria. 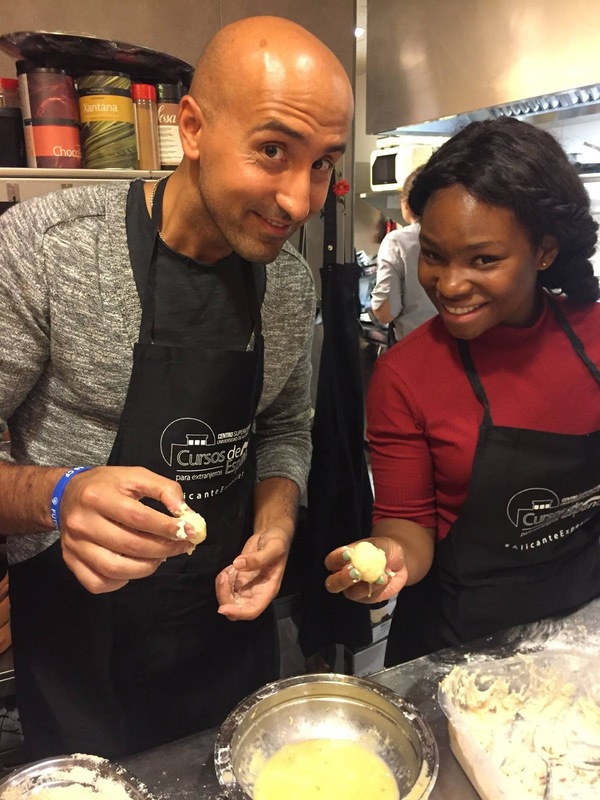 It was a wonderful experience, I was able to learn new Spanish recipes and meet new people who I would not have met in the classroom setting. Most importantly, I met a girl who was half German and half Nigerian (Igbo to be exact) it caught me completely off guard. 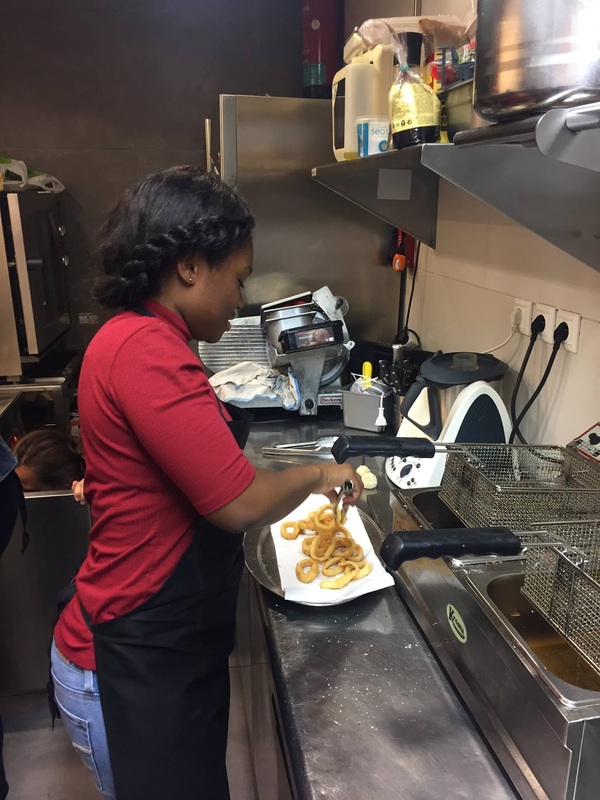 Initially, when she introduced herself she mainly said she was German and a part of me was in disbelief because I felt there was more to her than that. After doing a little investigation-- asking her what her full name was, if both of her parents were German-- I then able to discover she was also half Nigerian. From there we started a conversation about Nigerian culture (which was mainly led by me) because she had never been to Nigeria and knows little about the Nigerian culture or her roots. Therefore, I was telling everyone about my personal experience as a Nigerian-American and the lovely and life changing aspects about my beloved country. I expressed to my fellow sister that people identify themselves more with their tribe more than the country itself. 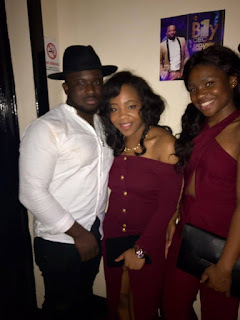 For example, she and I are both Nigerians but we are descendants from different tribes; I am from Edo State or Benin and her father's side of the family is from Igboland. Through this, I was able to inform her about the differences between our two tribes despite being from the same country. I assured her that regardless of our differences we all still consider each other as family. Overall, I was happy I went to the tapas cooking class because I was able to learn new dishes to bring back home and was able to meet a fellow sister of mine and talk and about my Nigerian culture. 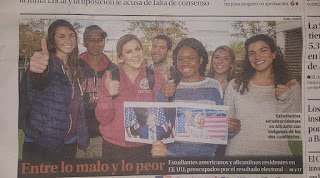 Shockingly, the Spaniards were so consumed by the election race as Americans were because they continuously asked us what we thought about the elections and who we wanted to be our next president. Many of us expressed how this election is probably the most unorthodox in US history because how can an inexperienced person in politics who disregards the humanity and respect of women, people of color, immigrants, muslims, and homosexuals have the potential of becoming the next president of the United States of America? On the other hand, a more than qualified woman was losing the trust of her country and potentially the election due to her past with classified emails. Many people were certain that Trump had no chance of winning the election. Personally, a part of me wanted to believe that Trump had no opportunity of winning but that was not the case. I have learned that in our culture of America, many people tend to publicly say one thing and then behind close doors do the complete opposite. I noticed this to be true before I left to Spain, (e.g it was more culturally acceptable to say yes I am going to vote for Clinton to prevent backlash for saying they will vote for Trump.) Therefore, when Trump became our newly elected president I wasn't in total shock because I realized that I prepared myself for the worst case scenario as the election results grew closer. Afterwards, I spoke to my parents and they were both in disbelief; my mother said there is reason why God chose him to be the president and my father was so sick to his stomach that he was unable to decipher what had just occurred. 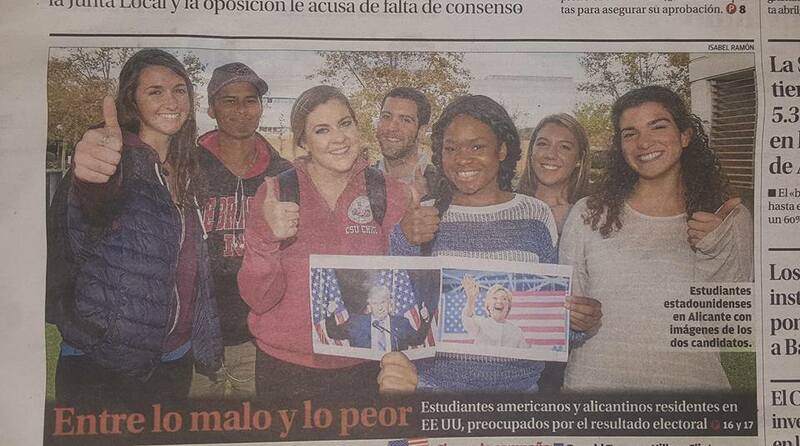 After the elections back in Spain, the Europeans basically said good luck to America, but a number of them also said we will just have to see what he does and hope for the best. I do not know why, but I feel like NY will be the one lucky state that will thrive through these next four years of Trump presidency. A part of me is like, "Efosa, just stay in Europe for the next 4 years”. Honestly, I was thinking about staying in Spain until my visa expires, have my mom send me my Nigerian passport and stay there for some time or go and lay low in China for a while. But I realized that running away from America will not solve the issues our country is plagued by because in actuality there is no one country that is perfect and there are still great things in America that I can't just desert it . The next step that needs to be taken are young adults researching about politicians at the local level who are capable of being president in the near future so that we don't have another election similar to this year. Truthfully, I know with the Grace of God I will still be successful regardless of who is in presidency. All we can do is just wait and see what type of legacy Trump will lead. That’s it for now everyone ! Since I can remember, I have always enjoyed learning about various cultures because I find it very fascinating how disparate parts of the world can be so close to each other but vastly different. Other than Spaniards, I have met many Norwegians, Asians (Koreans, Japanese, Hong Konger) Germans, Irish, Italians, Scotts, Poles and Finns. A common similarity I found between each of them is how commonly they know more than one language. I found it interesting that most of my classmates could speak at least three to four languages. I asked them was it a choice of their parents or mandatory from their ruling government? Each of them responded that it is encouraged in their country to know at least two languages if not three because Europe is a continent where there is an array of multiple languages. After hearing this, I was appalled because America as a whole is a country where English is preferred because there is this general misconception that everyone all over the world can speak or understands English. As a result, most Americans mainly speak English. Of course there is an exception to this, which is the people whose cultural background is not American, then being multilingual is encouraged (which is true in my family). Another observation I made about European countries is that after graduating from high school it is highly recommended the youth take a gap year. 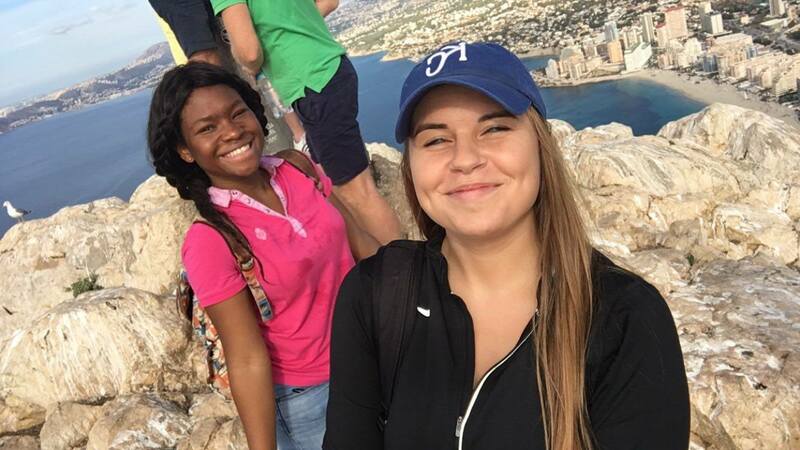 For a year or two, Europeans work, travel to different countries, join the army, or learn another language while figuring out what they want to do with the rest of their lives. Personally, I think the gap year phenomenon is a wonderful idea that needs to be broadcasted more in high schools especially in inner cities because I know a few of my close friends and associates who would have benefited from that experience. 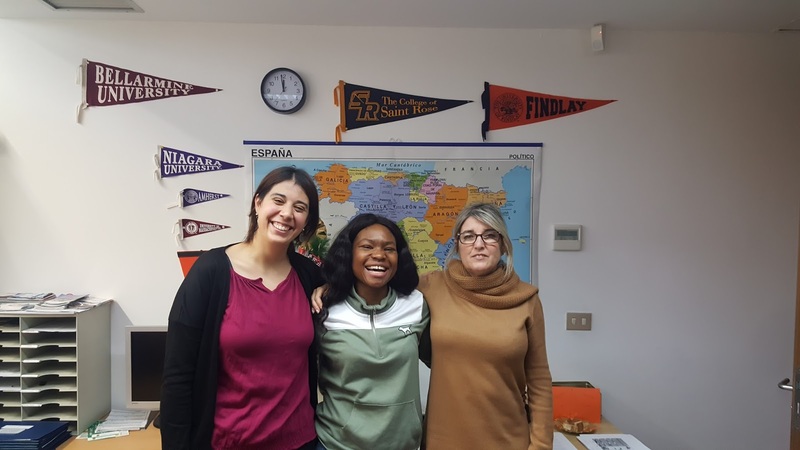 A week ago, I had the pleasure to listen to a first-hand perspective about the gap year programs from an young adult and her insightful parent. To my surprise a girl who is studying abroad with me mentioned how she did a gap year after high school and it was the best decision she could have ever made at that point in her life. She travelled to different parts of the world, met people with similar interests as her and most importantly was able to do self-discovery before embarking on her college journey. Afterwards, I asked her father, "Were you in full support of your daughter's decision to not enroll into college right after high school?" He responded truthfully, "Yes, I was 100 percent in support of her choice because we knew at the time if she went when she was not fully ready, then she would not appreciate college as much as she does now.” As the conversation continued about gap years , I realized that many of us attend college right after college not having a clue about what we want to major in let alone if college is what we want to truly do. Since attending college is a social norm or another life accomplishment to check off, many people enter college not mentally, financially, emotionally, socially or physically ready. Unfortunately, people do not finish college and have to suffer from the shame portrayed by their families and friends for being a “dropout”. I can say after this conversation and my personal experience with the college journey, I have a better outlook on the college process for high schoolers. Rather than expressing to them the only option they have is to attend college right after high school , I can inform them about gap year programs and the requirements, benefits, and the ultimate purpose of the programs. Towards the beginning of October a group of us decided to explore other parts of Alicante throughout the month. We first chose to visit Torrevieja, which is located in the southern region of Alicante. 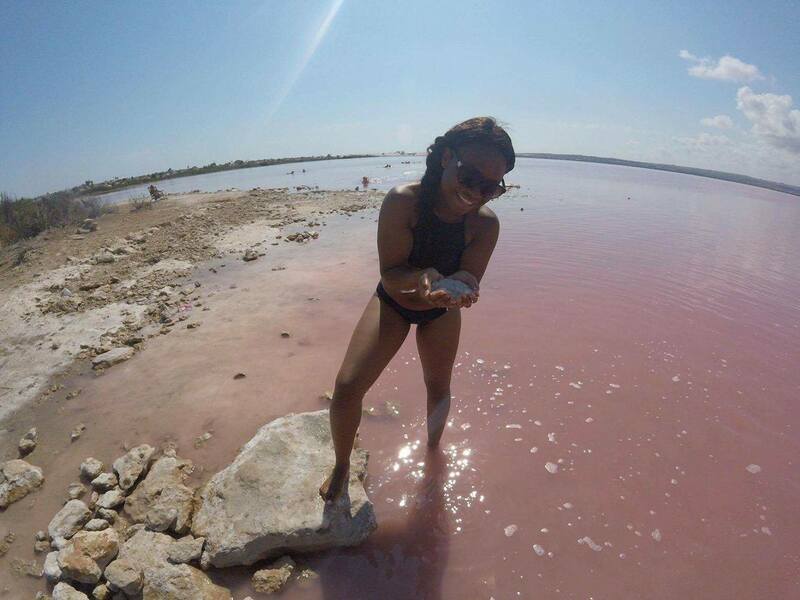 Torrevieja is a well known town in Alicante because it contains two salt lakes, a pink one and a green one. These lakes are very famous because they are referred to as a place where people can get a natural spa. 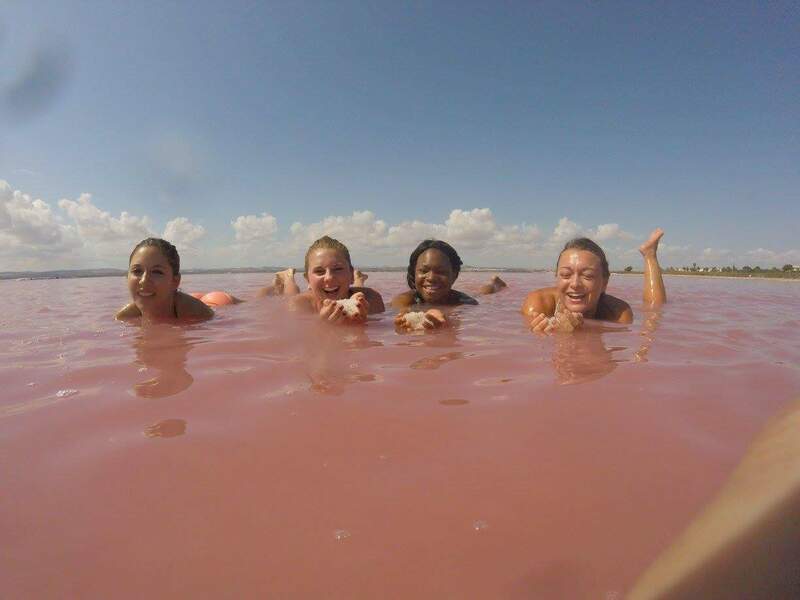 My friends and I decided to go to the pink lake which is called, Las Salinas de Torrevieja. It was an amazing trip because the lake was very similar to the Dead Sea in Asia. The water was so salty that after a while of being in the lake it started to burn the sensitive parts of our bodies. There was black mud near the lake that was used for therapeutic means by the locals and visitors. 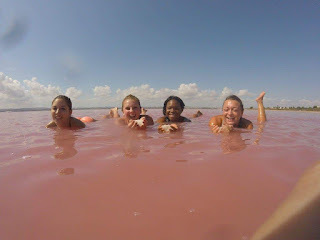 However, the most astonishing part about the lake (other than it being naturally pink) was when we would lay down , we did not sink we just floated and the water was so SHALLOW. We were able to pick up salt from the lake and see all the sea salt in its natural state. While my friends and I were relaxing in the lake and getting tanned we met these wonderful Swedish men who were so intrigued about our different regional backgrounds in the States. They were so happy to meet us and started talking about what life was like in Sweden and the similarities and differences between them and Norwegians. It was an interesting conversation because Norwegians and Swedish people are so similar to each other their differences are very minimal. The main difference was their accents and pronunciations with certain words or phrases. Another part of Spain we decided to visit for a weekend was Ibiza, which is known as the island where the best parties in the whole world take place. We took a bus to a boat in order to get to Ibiza and let me tell you , it was an interesting journey. I have never met a group of people who enjoy House Music as much as Spaniards. They were filled with so much energy that they were dancing for the entire 3 hr boat ride. IBIZA WAS THE HIGHLIGHT TRIP FOR THE MONTH OF SEPTEMBER. It was amazing meeting people from all over the world, enjoying different types of music especially HIP HOP , RNB, but that wasn't the best of it. On our last night in Ibiza we decided to go to a club called Pacaha, BEST DECISION WE MADE. The club was broken off into three or four parts where music of all sorts was played and I was so elated to find a part that was playing music from back home. Don't get me wrong I am enjoying my time in Spain and the music being played at the various clubs we visit, but a sister has to return back to her roots of Hip-Hop and RNB. As I was enjoying myself, and thinking this night couldn't get any better, I found I was gravely mistaken. After dancing for over three hours, I decided to take a break and THEY PLAYED AFRICAN MUSIC (IVORY COAST TO BE EXACT) ❗❗❗❗❗❗ I WAS SO EXCITED I JUMPED OUT OF MY SEAT AND STARTED BUSTING MY AFRICAN MOVES ON THE DANCEFLOOR. IT WAS SUCH A GREAT NIGHT & THE TIMING WAS PERFECT BECAUSE I WAS CELEBRATING THE INDEPENDENCE OF MY BELOVED COUNTRY, NIGERIA. AFRICANS ARE MAKING IT WORLDWIDE. ¡Hola Efosa! Muy Bien, ¿Cómo estas? It will be the last time, I would say those words in the morning before Spanish class because it was a new month and I was progressing to the next level of Spanish. Professor Santiago was a BLESSING sent from God. 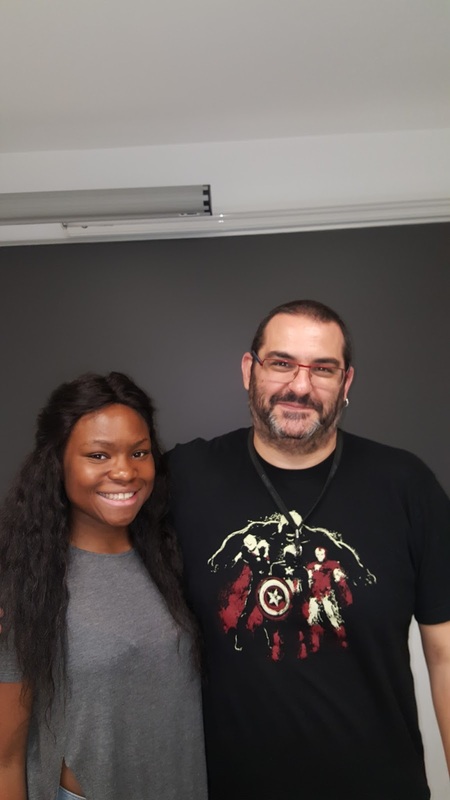 He helped me adjust to the academic customs in Spain, kept reminding me to not be so hard on myself and take everything a day at a time. He made learning Spanish fun and interesting by applying the lessons to realistic everyday scenarios (e.g introductions, expressing how you feel, describing professions and the places where people work etc.). For that I will forever be grateful to him. As I start my new level of Spanish class, I notice I am becoming more comfortable in conversing in Spanish with people outside of the classroom setting. Regardless if I say it correctly, I am having fun throughout the experience. (That's the whole point of this trip right?) Well until next time ! Hello Everyone, My name is Efosa and I am a junior majoring in Clinical Health Studies/Physical Therapy at Ithaca College with minors in Aging Studies (Gerontology) and Ithaca College's Honors Program.